is much bigger than the Common or German (European) wasp. Although considered much more aggressive than the common or German wasp, in our experience this is not the case. 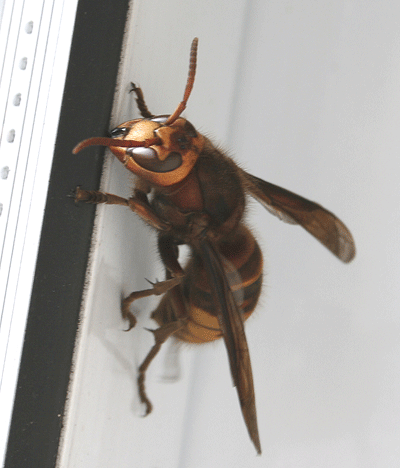 Hornet's only tend to become aggressive when defending their nests. Care should be taken when close to Hornets as their stings are particularly powerful, but a Hornet nest is easily treatable. The Hornet nest starts life in the spring by a queen. 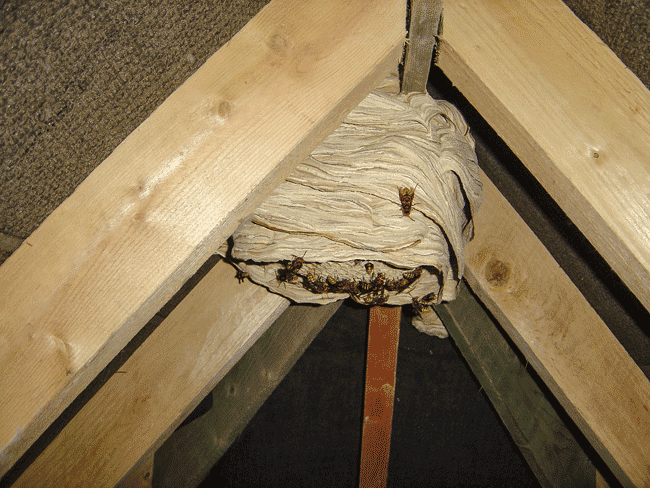 The location of the nest varies, but typically the location is in a place that is dry and undisturbed, loft spaces are particularly good places for a Hornets as they need an ample space in which to construct their nest. The nest is constructed from chewed wood and turned into a robust Paper Mache type material that is both strong, light and surprisingly waterproof. 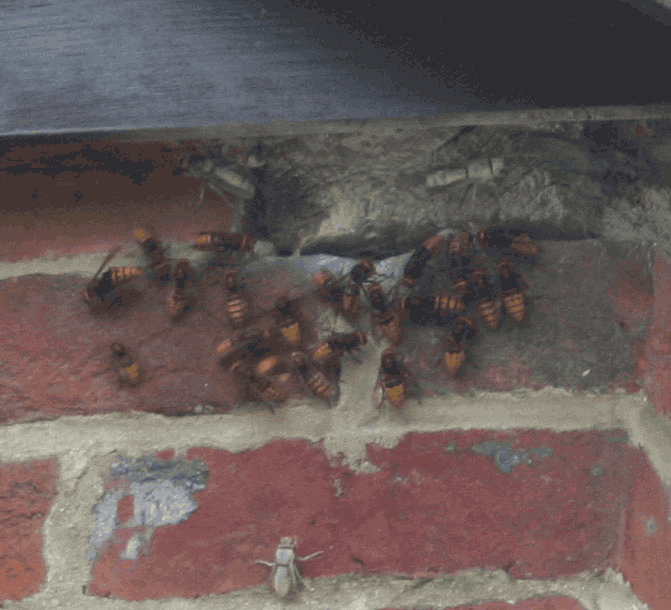 Video of a queen Hornet starting to build a nest. 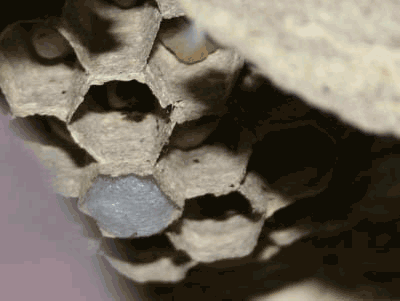 We are pleased to be able to bring you a video showing a queen Hornet starting her nest. The nest is very early in development. The nest begins with a dozen or so cells which are added to over time. The cells are arranged in horizontal layers called combs. Once an egg is laid, it takes between 5-8 days before they hatch into larvae. The larvae then undergo five stages of development over the next two weeks. 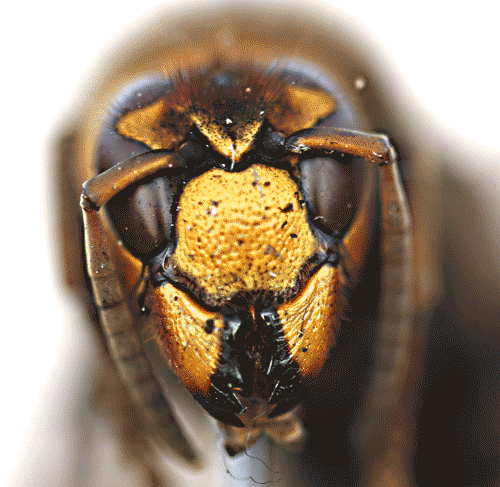 During this period the queen Hornet feeds the larvae a diet of protein-rich insect food. Once ready, each larva spins a silk cap over its cell opening and throughout the next two weeks its transforms (pupates) into an adult Hornet worker. In the following photo, you can see one of the larvae has spun its silk cap. If you look closely, you can see the other larvae in their cells. Once the newly pupated adults emerge they take over the functions that the queen initially carried out, such as nest building, water collection, foraging for food and tending new larvae. The only duty that the worker Hornets do not carry out is egg laying, a task explicitly reserved for the queen. Only the queen is capable of laying eggs. 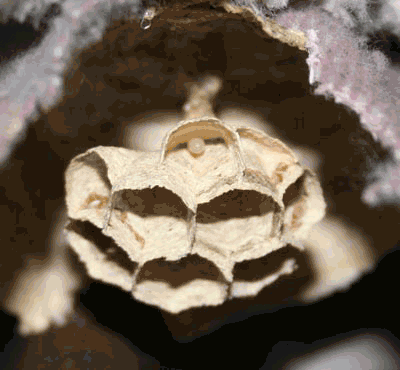 As numbers of individual Hornets expand in a nest, the nest itself has to grow in size to accommodate the colony; new combs are added to the nest at the same time. In late summer the queen starts to produce reproductive females and males. These are males and new queens. Male Hornets (drones) do not take part in nest building or maintenance, foraging for food or any of the regular duties that female worker Hornets undertake. In autumn, males (drones) and females (new queens) leave the nest to mate. Having mated the males die and the newly fertilised queens hibernate over winter, emerging in spring to start the whole process off again building their own brand new nest. The hornet is the only wasp which flies in the dark; they are nocturnal as well as day time hunters. Very often the first sign of a nest close by is when you hear large insects hitting against your windows at night time, as they are attracted to the lights inside. They can also assemble around outside lighting just as moths do. If you notice such activity, you have a nest very close by, usually within sight of your home.